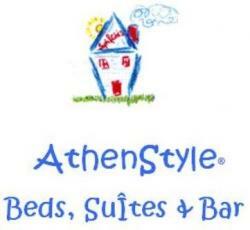 http://www.AthenStyle.com, one “s” – the only one, the original one! Be aware of other backpackers’hostels trying to use our brand: http://www.Athensstyle.com, two “s”, it’s not us! We are inimitable… we are.. the best hostel in Athens!! On 1st of June 2008 in Agias Theklas 10, in the real heart of the city, in the historical Monastiraki and right next to the unique “Psyrri” neighbourhood, was born AthenStyle hostel in a newly renovated historical building with an unforgettable roof terrace. Next Saturday 5th of June we want to celebrate two years of quality services and budget prices, fun and entertainment, friendly staff, the best views of the city, art exhibitions, decorated rooms by artists, international people, parties and celebrations, concerts, meeting point of travellers, city walks, love stories, friendships, info point…. the life of the best hostel in Athens!! June 5, from 6.30 pm to midnight!! If you have missed the exhibition… don’t worry! You still have the chance to come until June 12 and see the urban art photos and printworks by bleeps.gr and Christine Dinopoulous. Get exposed with the best club house djs in Athens Villa Mercedes Andronikou & Tzaferi 11, Rouf. 24 May Funcking Mondays Biggest hits of the 80’s, 80’s and 00’s. Messiah Club Gr Lampraki 2, Glyfada. h 24.00 dress code: funcking chic. Nella cultura mediterranea, la vita delle famiglie si mescola al contesto sociale in maniera spesso ironica ed imprevedibile. Le opinioni vengono discusse per strada, su qualsiasi argomento ognuno esprime la propria idea liberamente, lasciando passare la volontà innata di democrazia anche se talvolta risulta confusionaria. Ad Atene il caldo, l’aria, la gente, i palazzi, e le costruzioni compongono il contesto cittadino, che a volte sembra aver paura di aver perso il filo della storia ed il controllo della situazione. Si parla molto del recupero del centro, ma forse se ne fa più una questione mediatica. La porta di casa è un elemento che in maniera concettuale rispetta e descrive questo modo di essere. Spesso è infatti sostituita con una tenda a fili che ne occupa i volumi, lascia intatto il senso di ingresso-passaggio e contemporaneamente aumenta il senso di condivisione tipico della nostra cultura. In Mediterranean culture, family life mingles with the social context in an ironic and often unpredictable way. Opinions are discussed in the streets, on any topic each one expresses their ideas freely, letting out the innate desire for democracy even though it becomes sometimes confusing. In Athens the heat, the air, the people, the buildings, and the architecture make up the urban context, which sometimes seems to be afraid of losing the thread of history and control of the situation. There is much talk on the recovery of the city centre, but perhaps it is more perceived as a media issue. The front door of a house is an element which conceptually respects and describes this way of life. In fact, it is often replaced with a bead curtain which occupies its space while leaving intact the sense of entrance-way and simultaneously increases the sense of sharing typical of our culture. One Love Reggae ideas Floral 80 Themistocleous St. Exarchia Sq h 20.30 Free entrance. 14 May Sugarwave bazaar 14 and 15/05 sunny and cool summer bazaar suggestions. Ash in Art 10 Irakleous St Metro Fix. H Friday 16.00-22.00 Sat 11.00-22.00. Free entrance. Fragola Hysteria A concept party with lots of strawberries in any form: liquid, fluid and pure. The Society 6 Kolokotroni St. Syntagma. H 22.00 Admission free. 17 May Funcking Mondays Biggest hits of the 80’s, 80’s and 00’s. Messiah Club Gr Lampraki 2, Glyfada. h 24.00 dress code: funcking chic. If you hear about the riots in Athens and you are worried for your next trip, we want to inform you that it is safe to come to AthenStyle, to walk in this area and visit the touristic places and archaeological sites! It is true that the situation has been bad during today in Athens but tomorrow planes, public transportation, archaeological sites and offices will be working normally. Social protests in recent months due to political measures taken by the government are taking the streets in days agreed, but not something that happens every day. So… be positive with your next visit to Athens. If you have questions feel free to call or email us! Hope to see you soon at the hostel!